We would like to thank all pupils and parents who took part in our School Mini-Marathon this year. The event was a huge success with money being raised for sports equipment and music provision for the school. Music is a large part of our school life and we are fortunate to have strong relationships with many external agencies who support this aspect of the curriculum. To celebrate the children’s success in the performing arts, we have decided to hold an open-air concert on Thursday 18th May at 6:00p.m. You will be entertained by an array of musical items showcasing the importance of music education. Refreshments will be available during the interval. For those children who are interested in starting a new instrument in the Autumn Term, peripatetic teachers will be available following the concert to answer any queries. Trial sessions of instruments will be held in the second half of the Summer Term. We appreciate your continued support and hope to see you all. 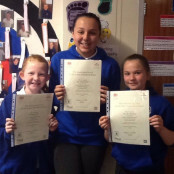 Congratulations to these girls for passing their music exams with The Associated Board of the Royal Schools of music. A big congratulations to Sander in Year 4, who has achieved his Grade 2 in recorder with a distinction. Well done! Well done to Bethan who has passed her Grade 1 recorder exam. 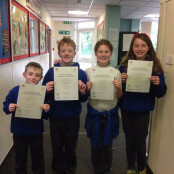 Well done to Ben, Danny and Amy who have passed their Grade 2 recorder exam. Please can all tea towel orders be in by Friday 12th May. This week has seen a positive start to the summer term. The Foundation phase topics are underway and new, exciting role play areas are being established –keep up to date with posts on class dojo and the school website. Keystage2 enjoyed an informative workshop relating to science, technology, engineering and maths this week. It focussed on breaking the gender stereotyping that surrounds these subjects and encouraged children to follow their interests. We will be holding an outdoor ‘musical extravaganza’ on Thursday 18thMay at 6pm to celebrate the success of this years musicians. As part of this we have been fortunate to work with Upbeat Music who have been working with children developing their understanding of improvisation, singing and group percussion performances. These workshops will continue up to the concert –we hope to see you there.